Unfortunately, due to the inability to see the back while training combined with the extreme volume of work performed for the pectoralis major, many trainees neglect proper balance... Here are details and exercises to change that. Learn more. Although not as heralded as its counterpart, the pectoralis major, the latissimus dorsi is synonymous with that elusive, highly sought after V-taper. Unfortunately, due to the inability to see the back while training combined with the extreme volume of work performed for the pectoralis major, many trainees neglect proper balance in their upper body training opting to prioritize chest development. The latissimus dorsi has two main actions on the arm. It functions in adduction (pulling the arms to the sides of the body form an out - to - the side position) and extension (pulling the arms down horizontal position straight out in front of the body ). As we will see, knowing these two primary actions will be a great tool in understanding the proper biomechanics for the latissimus dorsi exercises. As noted above, the latissimus dorsi has a strong action in the adduction of the humerus. Whenever we have two hands above our head, as with seated pulldowns or while doing pull-ups, due to the upward rotation of the scapula that accompanies glen humeral abduction, the latissimus dorsi effectively downwardly rotates the scapula by the pulling the entire shoulder girdle downward in active glen humeral adduction. Since it is one of the most important extensor muscles of the humerus, it contracts powerfully in chin-ups and supinated pulldowns. 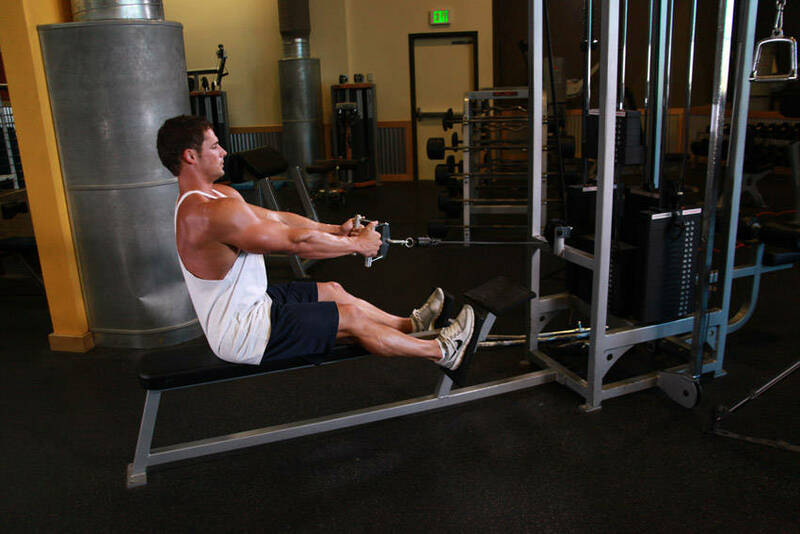 Any exercises in which the arms are pulled down bring the latissimus into a full contraction. A common mistake most people use too much weight and this causes them to use more of their arms instead of getting this full contraction. Any discussion of the latissimus dorsi must include a mention of the teres major muscle. The teres major is commonly referred to as the "lats' little helper" because the two have the exact same action on the arm. It is impossible to train one without the other. The origin of the teres major is on the edge of the lower edge of the scapulae (shoulder blades) above the latissimus dorsi. The insertion is on the head of the humerus, in virtually the same spot as the latissimus dorsi. The origin of the latissimus dorsi is the posterior crest of the ilium, back sacrum and spinous process of the lumbar and lower slips of the lower three ribs. The insertion is the medial side of the intertubercular groove of the humerus. The action is abduction, extension and internal rotation of the glenohumeral joint ... also horizontal abduction of the glen humeral joint. The innervation is the thoracodorsal nerve. 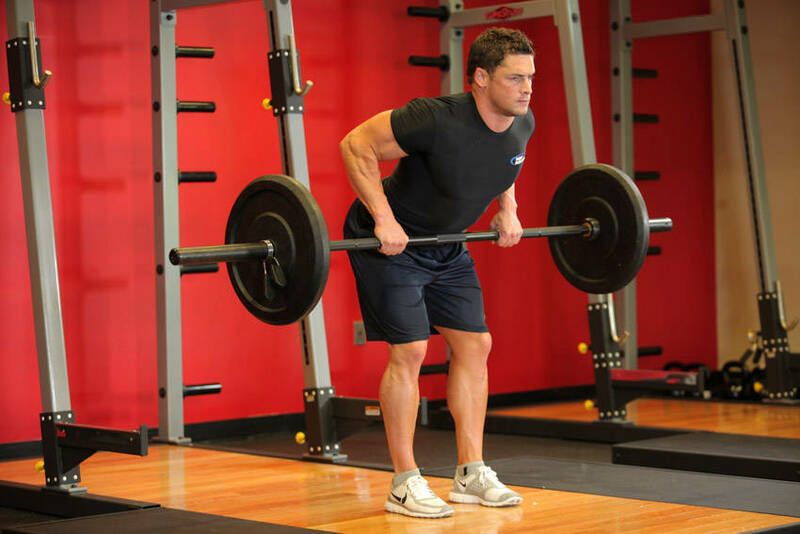 Grasp the bar with the arms slightly bent with elbows pointed away from the body. Make sure the knees are place firmly under the support pads that your feet are planted firmly on the ground. 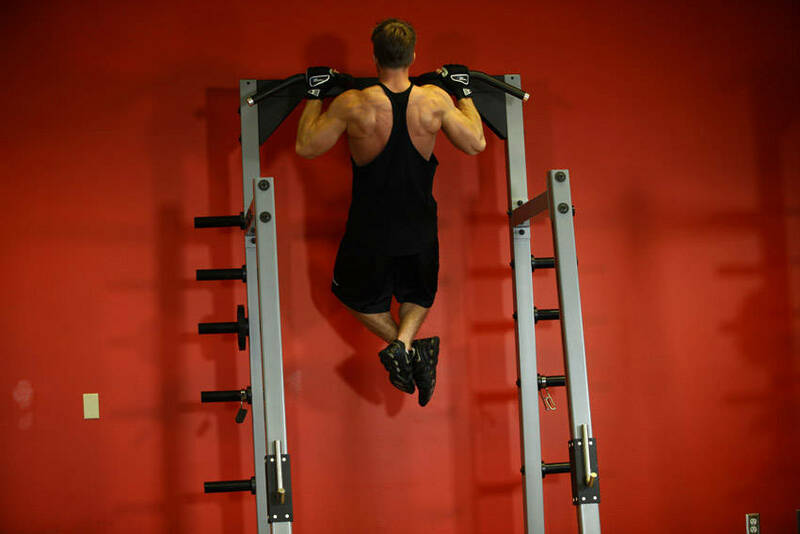 Lean back slightly ( approximately 15 degrees ) to allow the bar to travel in a correct downward path. From the starting position, pull the shoulder blades down and together. Begin to contract the latissimus dorsi by initiation contraction by bending the elbows. Keep the scapula retracted and depressed. 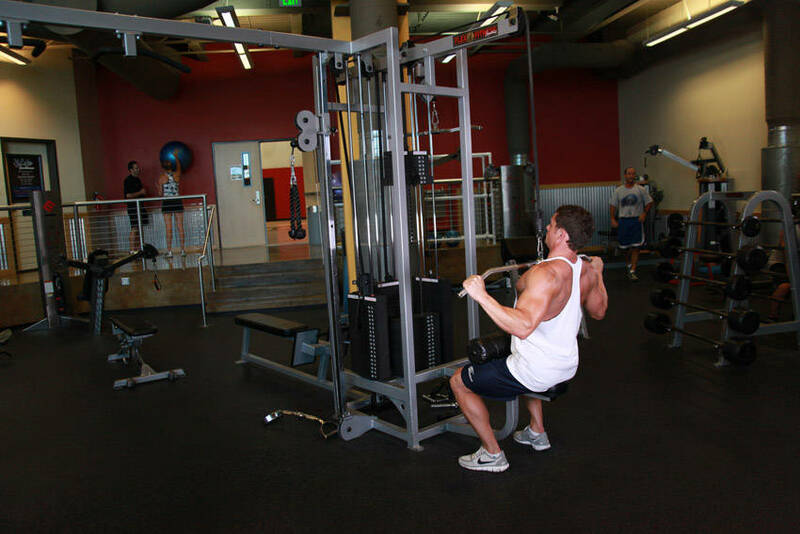 In a controlled manner, return the bar to its starting position. Concentrate on keeping the arms and hands relaxed while contracting the latissimus dorsi. Inhale on the upward phase of the eccentric movement and exhale on the downward concentric phase. Plant your feet firmly against the platform. Sit so that when you grasp the handles so your hands are slightly lower than shoulder height and positioned so your body is erect with chest slightly arched. Keep elbows slightly bent and pointed down. From the starting position, retract the scapula by pulling the shoulder blades down and squeezing them together. Contract the latissimus dorsi by pulling the arms back until the elbows are approximately beneath the shoulders. Continue the contract the latissimus dorsi as well as the rhomboids and middle trapezius. In a controlled fashion return to the starting position. Avoid rotation of the shoulders during execution. Keep elbows pointed down throughout the exercise. Remember to inhale on the downward eccentric phase and exhale on the upward concentric phase. 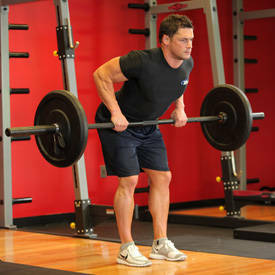 Grasp the bar using approximately 6 inches wider than shoulder width. Arms slightly bent with elbows pointed away from the body. Sine in a neutral position and head pointed forward. Retract and adduct the scapula. 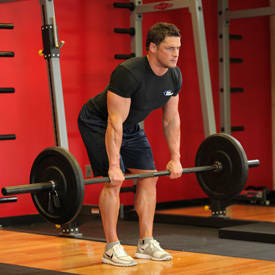 Bending at the elbow joint, pull your upper body toward the bar. Your thighs should be in line with your torso. Lower your body in controlled manner to the starting position. Do not allow your body to swing - keep your legs stationary during the movement. Pause for a second at the top of the movement and adduct the scapula. Return to the starting position, but don't let your arms lock out. From the hips, bend your upper body forward slightly parallel to the floor. 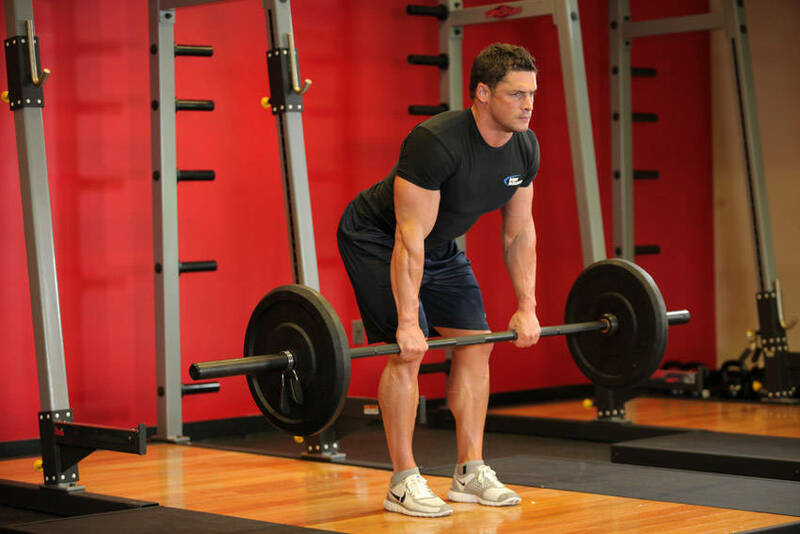 Grasp the bar with a supinated grip slightly closer than shoulder width. 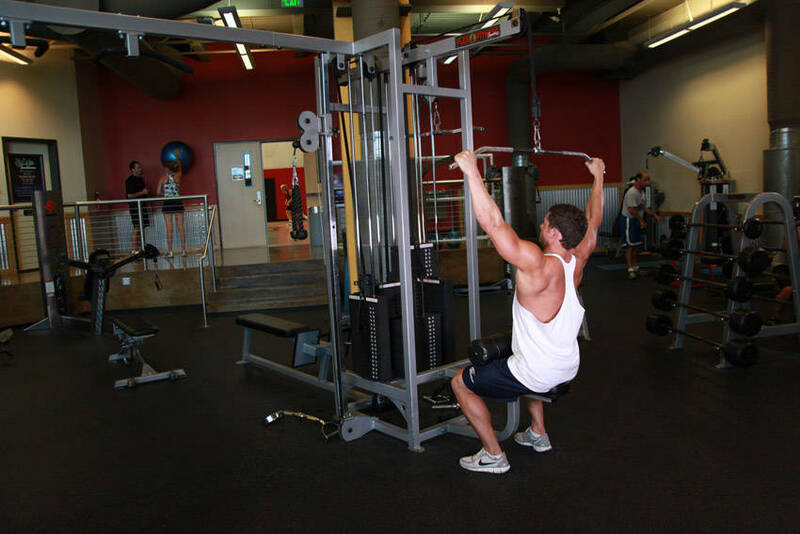 Allow the bar to hang with the elbows fully extended. Retract the scapula by pulling the bar up toward your chest. Contract the latissimus dorsi until the elbows are pointed directly up. Continue to contract the latissimus dorsi as well as the middle trapezius and rhomboids, while relaxing the hands and arms as much as possible. Returned in a controlled fashion. Maintain a rigid upper body, with a flat back. Keep the torso and knees in the same position through the exercise. Inhale on the downward eccentric movement and inhale on the concentric phase. In summary, I have just mentioned a few exercises, however there are more which you can do. For instance, I do dumbbell rows right before bent over rows because this isolates each latissimus before I hit both which seems to give me better concentric contraction during the bent over rows. I gauge my reps between 12-15 because I am concentrating on the retraction and squeeze of the scapula and contraction of the latissimus. I see so many people jerking and swinging through the movements because they worry about how much weight they use instead of a good concentric contraction.